Meeting with a business delegation from Hong Kong, Xi Jinping made it clear Beijing does not intend to compromise. Pan-democrats are unhappy with the plan approved by the National People’s Congress regarding Hong Kong’s 2017 election for chief executive. They argue the proposal, which calls for candidates to be chosen by a 1,200-person strong committee, will allow Beijing too much control over the nominating process. China, for its part, says it is within its rights to insist that every Hong Kong chief executive love both the mainland and Hong Kong itself. Beijing prefers to focus on the historical milestone of the first Hong Kong election decided by universal suffrage rather than the restricted nominating process. Amidst promises of protests and opposition in Hong Kong, Xi welcomed a large business delegation to Beijing. The delegation, which consisted of 70 leaders from Hong Kong’s business and professional sectors, was in Beijing for meetings on Monday. The group was led by former Hong Kong Chief Executive Tung Chee-hwa and included Hong Kong’s (and Asia’s) richest man, Li Ka-shing, as well as Pang Yiu-kai, the chairman of Hong Kong’s General Chamber of Commerce, and Stanley Lau Chin-ho, the chairman of the Federation of Hong Kong Industries. In addition to meeting with Xi, the delegation saw Zhang Dejiang, chairman of the National People’s Congress, and Vice President Li Yuanchao at a reception on Monday. But South China Morning Post did note one apparent change in Beijing’s stance. Unlike his predecessor Hu Jintao, Xi did not use the phrase “high degree of autonomy” when speaking about Hong Kong. Instead, he said that Hong Kong is a “local administrative region that comes directly under the central people’s government.” SCMP points out that this same phrase appears in Hong Kong’s basic law, with the added description of Hong Kong possessing a “high degree of autonomy.” This suggests the omission of the latter phrase was deliberate. Earlier this year, a white paper from China’s State Council noted that Hong Kong’s autonomy was a privilege that could be revoked at any time. Accordingly, some have read Xi’s refusal to use the phrase as an ominous sign for Hong Kong. Xi concluded by saying that he hopes that all the delegation members, as well as Hong Kong’s people in general, will “make contributions” to Hong Kong’s prosperity and stability. Beijing argues that Hong Kong’s silent majority is in favor of the NPC-approved plan for the 2017 chief executive elections. The CCP believes that the protests organized by groups like Occupy Central with Love and Peace represent only a vocal (and “trouble-making”) minority. A recent poll by the Chinese University of Hong Kong’s Center for Communication and Public Opinion Survey suggests otherwise. The poll found that 54 percent of Hongkongers believe the election draft rules should be rejected if they would prevent politicians who disagree with Beijing from serving as candidates for chief executive. 29 percent favored passing the draft rules. A desire to veto the draft rules was highest among the young, with 76 percent of people aged 15 to 24 and 65 percent of those between 25 and 39 wanting to reject the proposal. Higher levels of education also positively correlated with disapproval of the draft rules. Even if most Hongkongers are underwhelmed by the NPC’s version of the draft rules, it’s unclear how far that will translate into political action. This will soon be put to the test. 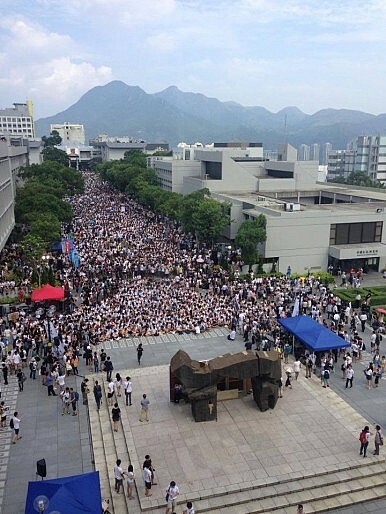 The clash between Beijing’s line and pan-democrats heated up on Monday, as thousands of Hong Kong university students joined in a strike to show their displeasure with the proposed election rule. The student strike is being billed as merely the beginning of a string of protests. The most notable demonstration in the works is Occupy Central’s plan to organize large-scale protests and sit-ins in Central, Hong Kong’s main business district.